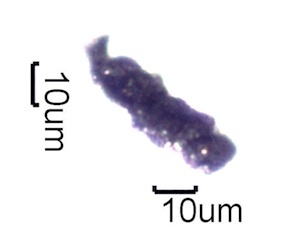 The smoke plume from an uncontrolled fire contains particles and gases as it leaves the combustion zone. 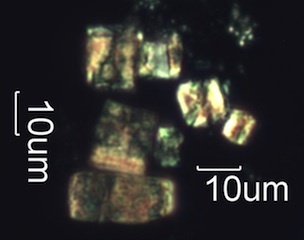 The gases include water vapor, carbon dioxide, carbon monoxide, nitrogen oxides if the combustion zone is hot enough, and volatile organic compounds. 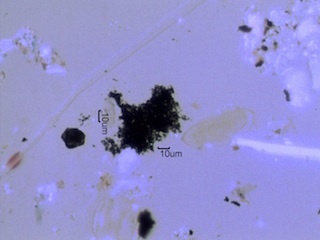 The volatile organic compounds begin as gases but much of those materials will condense or sorb onto the particles in the plume. 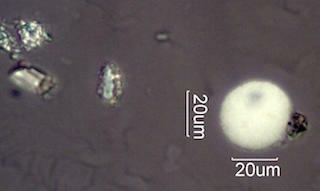 Some will stay in the gaseous state. 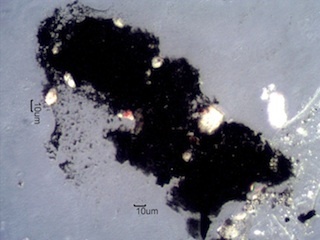 The particles from combustion include charred and coked fuel, pyrolized associated materials, and agglomerates of "soot" and condensed organic compounds. 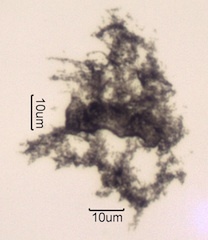 The distribution of the materials associated with the plume at the receptor site will depend on the size of the particles, their sticking coefficient relative to the surface they contact, distance from the fire, and time of transit from the combustion zone to the receptor. 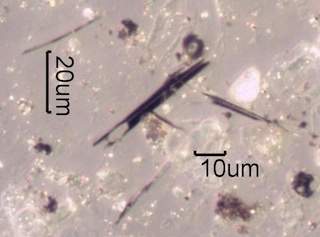 The particles from the smoke plume leave a signature at the receptor site that can often be used to determine the impact of the fire at that location. 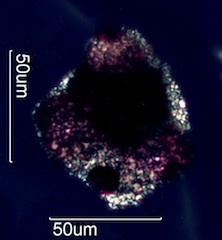 The signature at the receptor site will change with time so sampling at the receptor site soon after exposure is most desirable, though some evidence of exposure may persist for years. 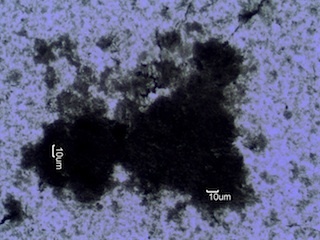 The materials covered here are related to uncontrolled fires and not controlled combustion sources. 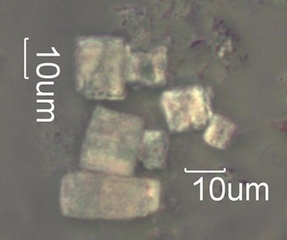 Emissions from internal combustion and diesel engins, boilers of all types, and smoking of tobacco or other plants are not included here. 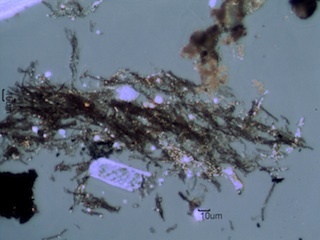 Emissions from fireplaces, wildfires, house fires, industrial fires, field burning, and yard waste fires are included. 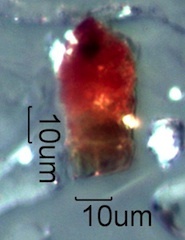 Wildfires include forest fires and brush fires. 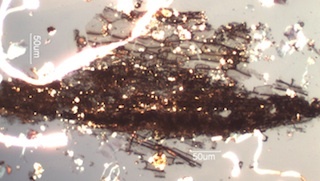 Backdrafting in the fireplace or a leaking chimney will emit materials from the fire in the fireplace into the living zone of the building. 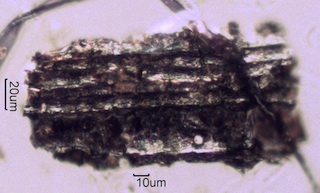 Fireplace emissions are dominated by spalled coked wood cells and a relative absence of other charred plant material. 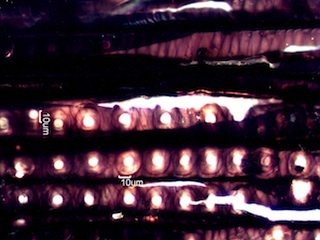 The intent of burning wood in a fireplace is to consume all of the core of the wood. 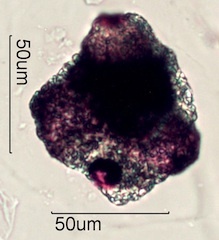 This is distinct from wild fire that burns the outside of the plant and tends to leave the charred core. 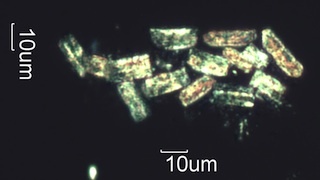 Fireplace debris is defficient in pyrolized phytoliths and burnt clay compared to forest fire smoke. 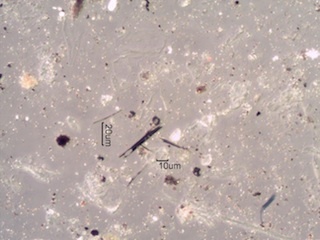 Burning waste materials in the fireplace will add to the complexity of the emissions but will not add phytoliths or burnt clay. 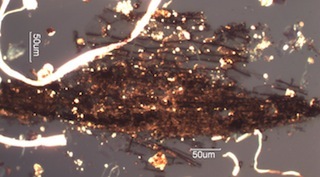 House fire particles tend to be dominated by charred Douglas fir or Pine, high hydrocarbon content soot agglomerates from burning plastics and synthetic fibers, charred paint, and soot coated glass fiber. 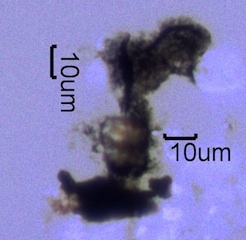 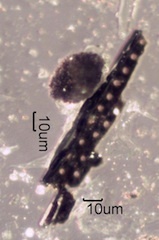 The agglomerated soot tends to be absent in wild fires, fireplace emissions, field burning, and the backyard burning of leaf and plant trimming. 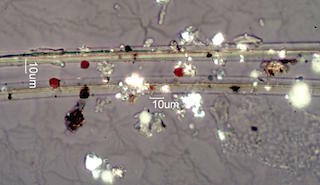 Industrial fire particles tend to be characterized by the materials related to the industry. 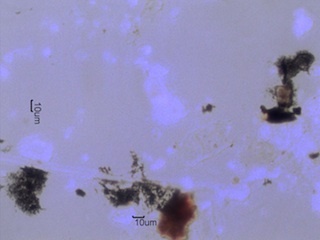 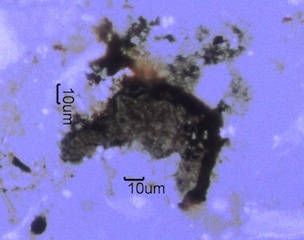 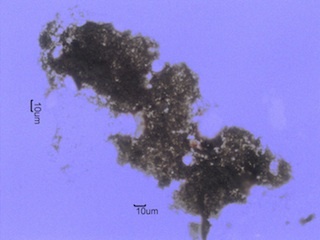 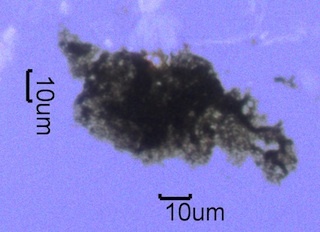 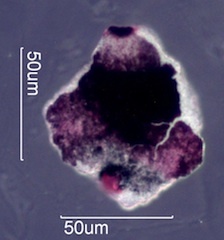 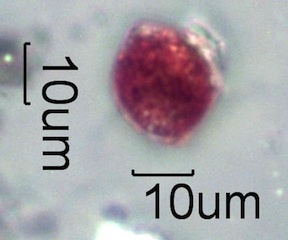 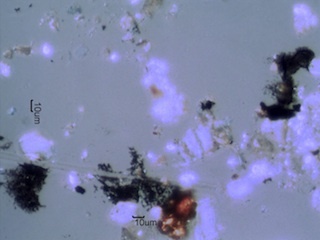 Agglomerated soot particles tend to be very common. 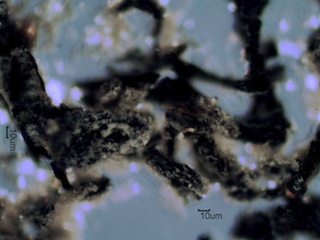 Wildfires create strong winds and updrafts that carry large amounts of burnt soil, charred bark, charred wood, charred leaves, other charred plant material, pyrolized phytoliths, and other charred biologicals in their plume. 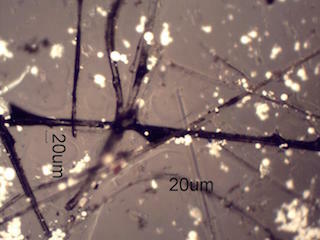 In forest fires and brush fires the plants burn from the outside in rather than from the inside out, as in a fireplace. 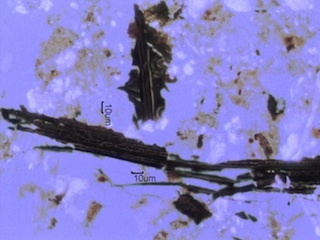 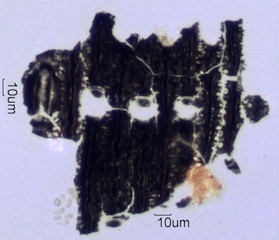 As a result phytolith rich bark generally provides a strong source for pyrolized phytoliths. 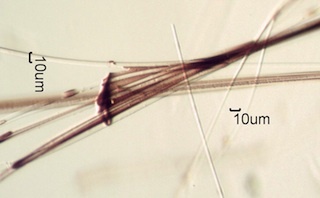 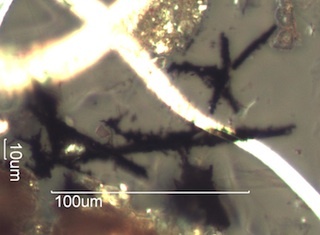 The type and frequency of phytolith will depend on the fuel at the location of the fire. 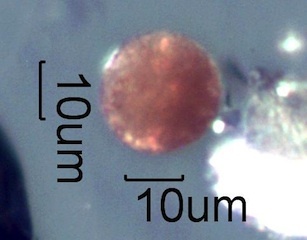 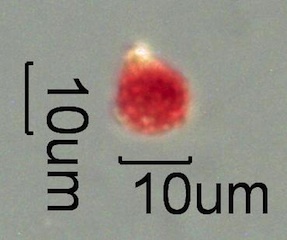 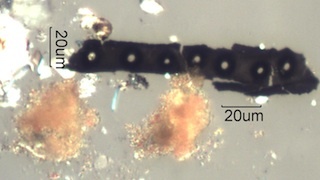 Fire retardant aerosol particles may also be present as part of the assemblage. 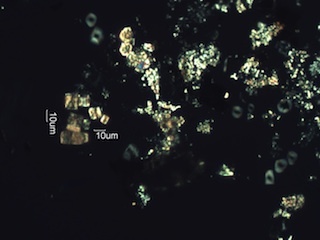 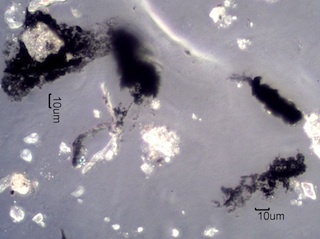 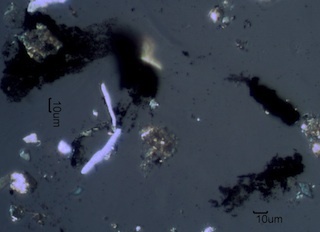 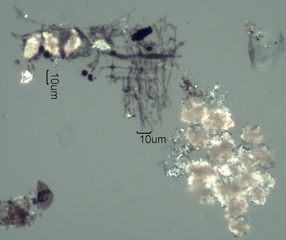 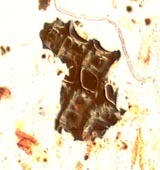 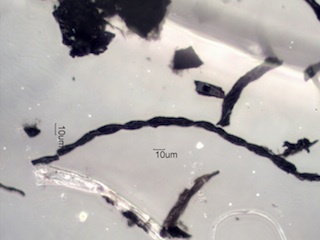 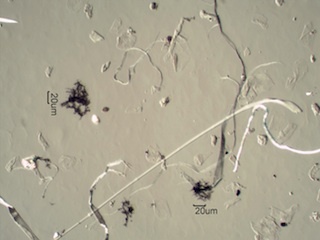 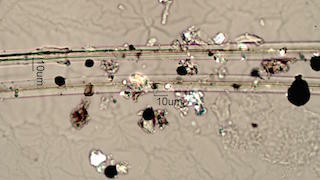 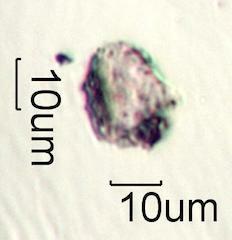 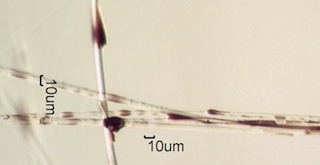 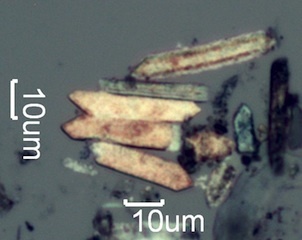 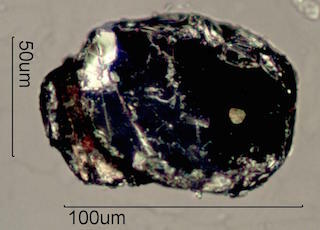 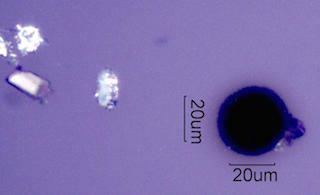 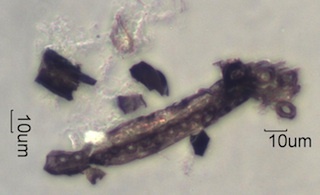 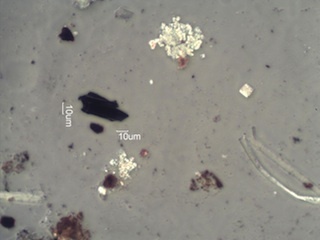 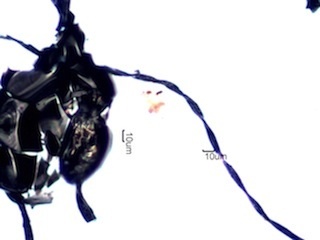 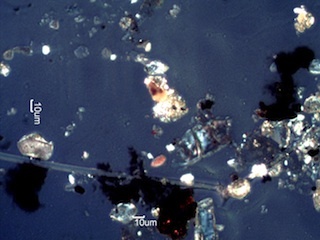 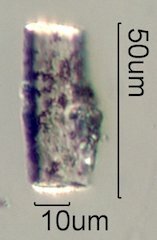 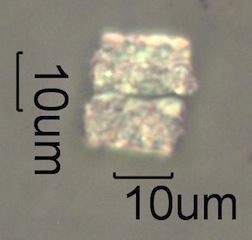 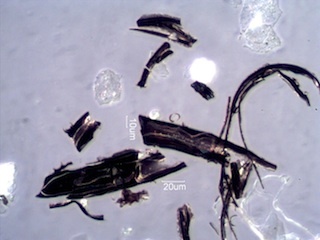 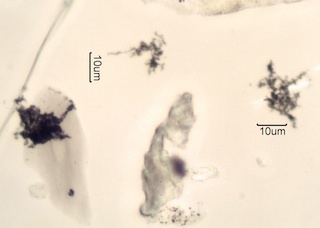 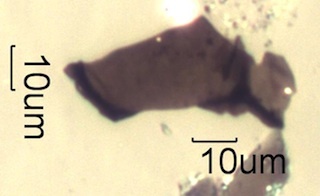 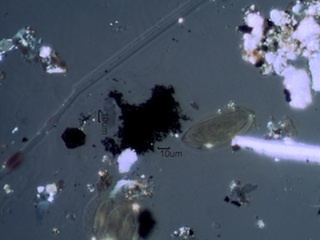 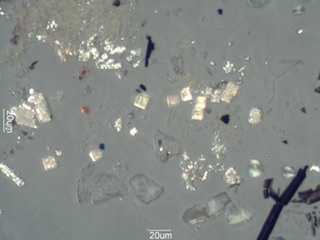 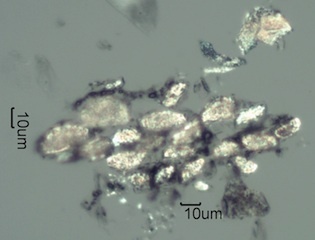 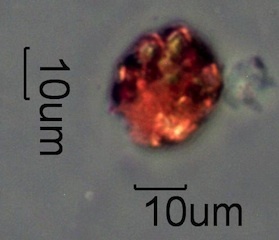 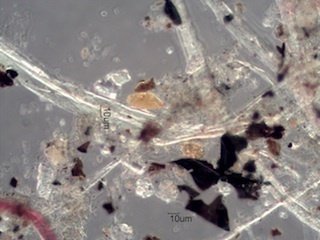 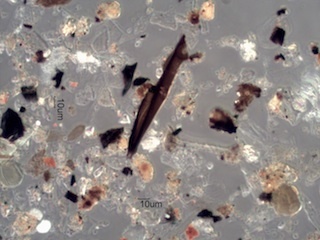 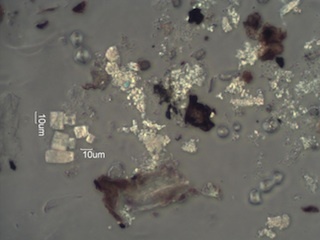 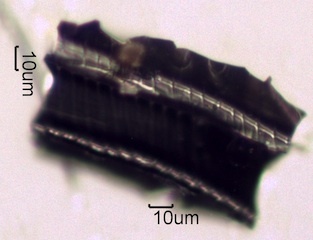 Pyrolized silica phytoliths may show little change other than the charred cellulose debris still attached to the phytolith. 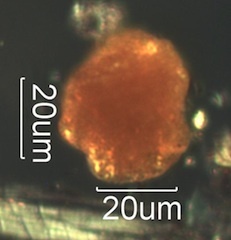 Fire retardant spheres can generally be distinguished from red spray paint spheres by the larger crystals and lower vehicle content of the fire retardant. 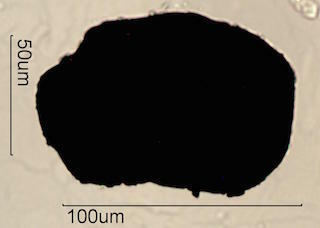 The vehicle content of most paints is about 20% but gel in the fire retardant is about 5%. 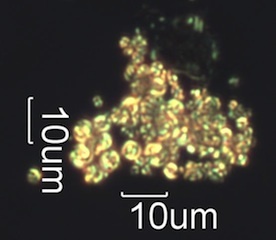 The mineral filler in spray paint tends to be quite small while the crystals in fire retardant grow as the water evaporates and tend to be much larger than the pigment (iron oxide). 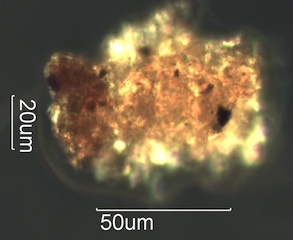 Most of the fire retardant used for wildfires is pigmented with red iron oxide (hematite) so other colors of spray paint won't interfere. 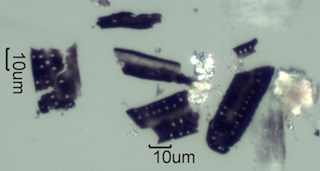 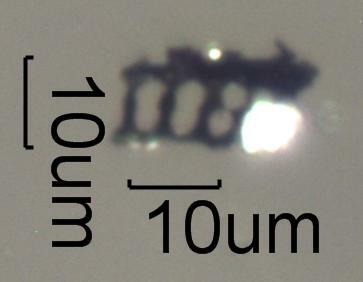 Particles Commonly Misidentified as "Char"
Many opaque or black particles are common in the environment and may be misidentified as combustion products if reflected darkfield illumination is not used along with transmitted polarized light. 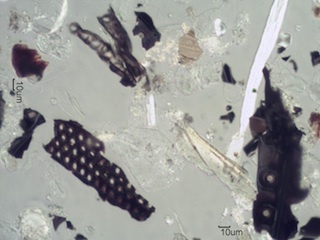 These are just a few examples.